Steven Miller works in oils on canvas inspired by pop culture, world events and natural elements. He usually works in a series of paintings. He states that “The ideas behind these works still hold a strong fascination for me and continue to provide me with boundless inspiration. The work I produce is all about color, form and simplicity”. Life quite simply as a force of nature captured on canvas. Mr. Miller has exhibited his work across the United States from New York to Los Angeles, and in Europe from London to Cologne. He is a Vinalhaven Fellow, a Rubenstein Scholar, a Parsons School of Design Scholar and a Pollock-Krasner Foundation recipient. His work has been featured in major television shows and Hollywood films. Steven Miller’s work has been featured in Architectural Digest, Elle Decor, Art Gallery International Magazine and ARTnews. Mr. Miller’s work is in many private and public collections in the United States, Europe and Asia. 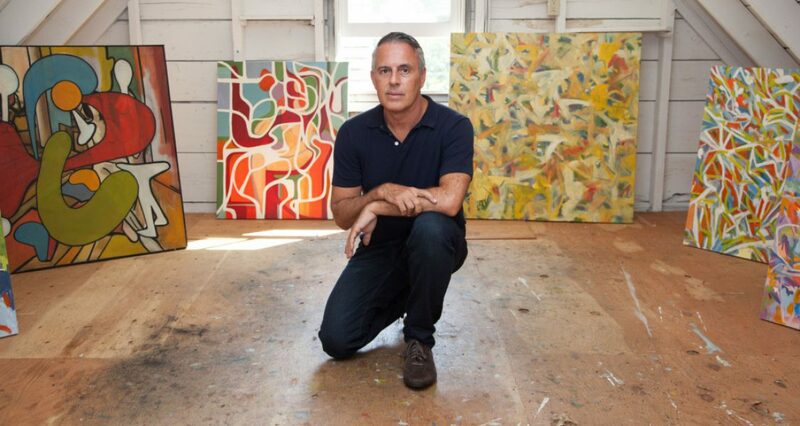 His work has been added to the permanent collections of the University of Virginia’s Bayly Art Museum, the Savannah College of Art & Design Museum in Georgia, the Edward F. Albee Foundation, JP Morgan Chase, The University of Miami, Forbes, Proctor & Gamble, Google, Instagram and most recently was added to the permanent collections of the MOMA in New York. See a complete profile and additional artworks click on link https://www.singulart.com/en/artist/steven-miller-1682. Are By of these for sale? Love your work! I am interested in purchasing as well. Strong work. The colour lines are very seductive.